Welcome! This Libguide is intended for use in understanding the concepts of the doctrine of Fair Use relating to use of copyright materials used in courses at USMA West Point. Articles and News Items on Fair Use and Copyright in the News. Explains Fair Use as described by the Copyright Website. Fair Use is a hotly debated issue, click here for more information. USMA JAG Office link for Civil Law questions. 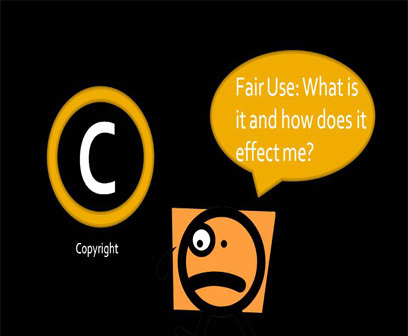 If you are in need of specific information or answers on whether your use of a copyright protected resource is "Fair Use" contact the USMA JAG at 3205. You can ask for it. If you know who the copyright owner is, you may contact the owner directly. If you are not certain about the ownership or have other related questions, you may wish to request that the Copyright Office conduct a search of its records or you may search yourself. See the next question for more details. We can provide you with the information available in our records. A search of registrations, renewals, and recorded transfers of ownership made before 1978 requires a manual search of our files. Upon request, our staff will search our records at the statutory rate of $165 for each hour (2 hour minimum). There is no fee if you conduct a search in person at the Copyright Office. Copyright registrations made and documents recorded from 1978 to date are available for searching online. For further information, see Circular 22, How to Investigate the Copyright Status of a Work, and Circular 23, Copyright Card Catalog and the Online File. How can I obtain copies of someone else's work and/or registration certificate? The Copyright Office will not honor a request for a copy of someone else's protected work without written authorization from the copyright owner or from his or her designated agent, unless the work is involved in litigation. In the latter case, a litigation statement is required. A certificate of registration for any registered work can be obtained for a fee of $35. Circular 6, Access to and Copies of Copyright Records and Deposit, provides additional information. Under the fair use doctrine of the U.S. copyright statute, it is permissible to use limited portions of a work including quotes, for purposes such as commentary, criticism, news reporting, and scholarly reports. There are no legal rules permitting the use of a specific number of words, a certain number of musical notes, or percentage of a work. Whether a particular use qualifies as fair use depends on all the circumstances. See FL 102, Fair Use, and Circular 21, Reproductions of Copyrighted Works by Educators and Librarians. How much do I have to change in order to claim copyright in someone else's work? Only the owner of copyright in a work has the right to prepare, or to authorize someone else to create, a new version of that work. Accordingly, you cannot claim copyright to another's work, no matter how much you change it, unless you have the owner's consent. See Circular 14, Copyright Registration for Derivative Works. A party may seek to protect his or her copyrights against unauthorized use by filing a civil lawsuit in federal district court. If you believe that your copyright has been infringed, consult an attorney. In cases of willful infringement for profit, the U.S. Attorney may initiate a criminal investigation. Could I be sued for using somebody else's work? How about quotes or samples? If you use a copyrighted work without authorization, the owner may be entitled to bring an infringement action against you. There are circumstances under the fair use doctrine where a quote or a sample may be used without permission. However, in cases of doubt, the Copyright Office recommends that permission be obtained. No, we neither compile nor maintain such a list. A search of our records, however, may reveal whether a particular work has fallen into the public domain. We will conduct a search of our records by the title of a work, an author's name, or a claimant's name. Upon request, our staff will search our records at the statutory rate of $165 for each hour (2 hour minimum). You may also search the records in person without paying a fee. With few exceptions, the Library of Congress does not own copyright in the materials in its collections and does not grant or deny permission to use the content mounted on its website. Responsibility for making an independent legal assessment of an item from the Library’s collections and for securing any necessary permissions rests with persons desiring to use the item. To the greatest extent possible, the Library attempts to provide any known rights information about its collections. Such information can be found in the “Copyright and Other Restrictions” statements on each American Memory online collection homepage. If the image is not part of the American Memory collections, contact the Library custodial division to which the image is credited. Bibliographic records and finding aids available in each custodial division include information that may assist in assessing the copyright status. Search our catalogs through the Library's Online Catalog. To access information from the Library’s reading rooms, go to Research Centers. Whether or not a particular work is being made available under the authority of the copyright owner is a question of fact. But since any original work of authorship fixed in a tangible medium (including a computer file) is protected by federal copyright law upon creation, in the absence of clear information to the contrary, most works may be assumed to be protected by federal copyright law. Since the files distributed over peer-to-peer networks are primarily copyrighted works, there is a risk of liability for downloading material from these networks. To avoid these risks, there are currently many "authorized" services on the Internet that allow consumers to purchase copyrighted works online, whether music, ebooks, or motion pictures. By purchasing works through authorized services, consumers can avoid the risks of infringement liability and can limit their exposure to other potential risks, e.g., viruses, unexpected material, or spyware. For more information on this issue, see the Register of Copyrights' testimony before the Senate Judiciary Committee. Can a school show a movie without obtaining permission from the copyright owner? If the movie is for entertainment purposes, you need to get a clearance or license for its performance. It is not necessary to obtain permission if you show the movie in the course of “face-to-face teaching activities” in a nonprofit educational institution, in a classroom or similar place devoted to instruction, if the copy of the movie being performed is a lawful copy. 17 U.S.C. § 110(1). This exemption encompasses instructional activities relating to a wide variety of subjects, but it does not include performances for recreation or entertainment purposes , even if there is cultural value or intellectual appeal. Questions regarding this provision of the copyright law should be made to the legal counsel of the school or school system. There may be situations in which the reproduction of a photograph may be a “fair use” under the copyright law. Information about fair use may be found at: www.copyright.gov/fls/fl102.html. However, even if a person determines a use to be a “fair use” under the factors of section 107 of the Copyright Act, a copy shop or other third party need not accept the person’s assertion that the use is noninfringing. Ultimately, only a federal court can determine whether a particular use is, in fact, a fair use under the law. Note: The Copyright Office offers introductory answers to frequently asked questions about copyright, registration, and services of the Office. Links throughout the answers will guide you to further information on our website or from other sources. For any other questions, please visit our Contact Us page.